Just to follow up on our previous article. We have found distinguishing characteristics for at least five different Mach 1s used in DAF. 43 years ago today, "Diamonds Are Forever" was released to anxious Bond fans in the United States. This movie marked the 3rd time a Mustang appeared in a Bond flick, and the first time we get to watch 007 behind the wheel of one of our beloved pony cars. Even with its legendary continuity issue with the 2-wheel alley stunt, it still remains the ultimate car chase for fans of both the Ford Mustang and James Bond 007. Today we release the culmination of months of research and analysis for our fellow Mustang and Bond enthusiasts. A lot of details have been uncovered since we published our last article about this famous movie car. With the help of Kurt Kaminer, we have identified five unique Mach 1s used for filming. Kurt is a frequent contributor to the 7173Mustangs.com forums, his attention to detail is amazing and not only is he a 1971 Mustang owner, he has an extensive knowledge of these cars. Kurt also has a background in camera and film. His insight on camera and lighting characteristics used on 1971 era equipment was very helpful during this research. Together we have created a comprehensive list of distinguishing characteristics for the five Mach 1s we identified in "Diamonds Are Forever". For our research, we used hi-res stills from the Blu-ray movie itself. We also used the deleted scenes and bonus material included on the Blu-ray. And lastly we used several promotional and behind-the-scenes photos to narrow down some details. We found a great resource for James Bond photos through Robert Ganz. If you are a Bond fan, you should check out his impressive collection of photos. We have numbered the cars CAR 1 through CAR 5...this order represents the order of appearance in the movie and has no other significance. Its just how we reference them for the purpose of this article. In addition to researching the Mach 1s, we were also able to determine a rough time frame when scenes of the movie were filmed. Not totally surprising, the filming sequence is not the same as the sequence of events in the movie. 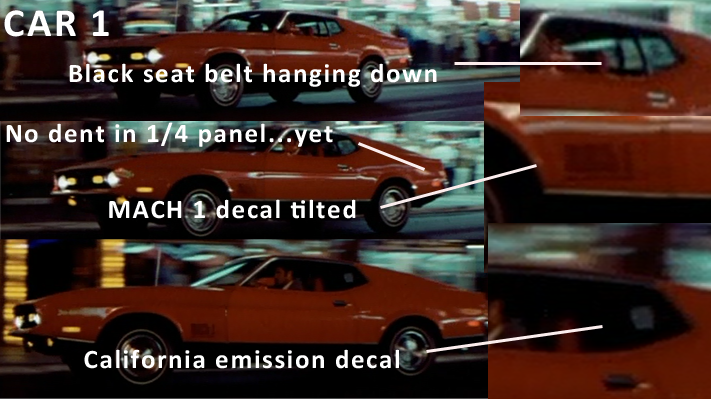 The filming sequence is important for determining the different characteristics of each Mach 1. Some of the characteristics change during filming. For example, a new dent appears or a decal is removed. Here is a rough sequence of the filming schedule. Note, the "~" represents an approximate date. The "-" represents an exact date. Even though we do not have a complete list of "exact" dates, for the purpose of our research, the sequence is more important than the actual date. We will reference these dates as we describe the characteristics of each car. (3) Comments made in "Top Gear Special 50 Years of Bond Cars"
Note: We reset our day at dawn instead of midnight. We do so because it just makes it easier when referring to night time events. For example; the 270° stunt was being filmed from 11:30pm to 01:29am...we consider that all part of the 04/13 filming date. We have identified this car as the primary or "hero" car used in the film. It is used for almost all of the close up scenes with the actors, as well as most of the chase sequences on Fremont Street. It makes a short, close-up appearance in the parking lot. It was also used at the airport, the gas station and the desert sequence at the gypsum plant. It does not appear in any of the 2-wheel alley stunts. Fortunately, with all the closeups of this Mach 1, we are able to distinguish a lot of details about the car. Our big break came when we purchased a behind the scenes picture with Sean Connery (grayed out pending permissions) standing next to the car with the door open, almost as though he was saying "hey, check out this interior! "...Which we did! We noticed there is no light or illumination coming from the center dash. If this Mustang was equipped with the Convenience Package option, the center dash mounted map light would be visible and illuminated with the door open. The radio is characteristic of the 8-Track Stereosonic Tape System. This car is equipped with the Mach 1 Sports Interior Package option so it would have come standard with a clock in the instrument cluster and the triple gauge pod in the center dash, which is visible here. Working our way down, there is a "Mach 1" block off plate in the console. That means this Mach 1 was not equipped with the Tachometer Instrumentation Group option. If it was, the clock would have been relocated to the console to make room for the tach in the dash. No roll-bar. The other Mach 1s have a visible roll-bar installed. Dent in left hand rear quarter panel. This appears to have happened while filming on 04/13. Sometime between filming the sidewalk stunt and the 270° turn. Black seat belts. The left hand shoulder harness can be seen hanging down in all of the filming sequences. The MACH 1 decal on the left hand fender has a noticeable tilt to it. It sits lower in the front than in the back. California Highway Patrol Vehicle Inspection sticker is displayed in the lower right hand windshield. The decal is parallel to the 'A' pillar and is very low on the windshield. Gaffers tape was installed on the entire windshield trim and 1/4 window vertical weatherstrip molding for the parking lot sequence. Between 04/14/1971 and 05/05/1971 there is a piece of black gaffers tape covering the right hand vertical windshield molding. Possibly a left over from filming the parking lot sequence. Before filming the gas station scene, approx 5/9/71, the CHP decal and gaffers tape are removed. In the bonus materials there is a decal in the left hand 1/4 window that is consistent with the "EXHAUST EMISSION CONTROL INFORMATION" decal. Ford put this decal in all new cars shipped to California with the NOX Emission Control System. This was filmed early as the "J" turn scene it was used in was re-filmed later with CAR 2 and the decal is not seen in CAR 1 at any other time. This is a stunt car used for the Fremont Street chase. It has a red roll-bar and some type of bracket in the rear seat area, possibly for camera equipment. We never see any shots from inside the Mach 1, so the use of this bracket is never confirmed. But it is a visibly distinctive feature none the less. CAR 2 is used for the "J" turn stunt as Bond first backs away from the Sheriff. It is also used in the chase scenes where the the police car is close on the Mach 1's tail as they weave in and out of traffic on Fremont Street. It can also be seen in the tight left hand turn where the pedestrians are running for cover. The MACH 1 decal on the left hand fender sits a bit higher compared to the other Mach 1s. There is no visible CHP Vehicle Inspection decal in the windshield. This is the car that performs the 2-wheel stunt, exiting the alley, driver side down. It is first used in the parking lot sequence. You can see the roll-bar and CHP Vehicle Inspection sticker as it comes squealing around the corner and then turns into the Mint Parking Lot. You can also see the roll-bar and CHP sticker during some of the chase scenes in the parking lot. During the parking lot sequence this car has gaffers tape on the 1/4 window vertical trim. You get a pretty clear shot of the underside of this car during the 2-wheel stunt. You can see the dual exhaust, C6 transmission and the roll-bar mounting bracket. You can even see the red and orange identification paint stripes on the rear of the leaf springs. That gives us a hint of when the car was produced. Black standard seat belts. You can see the shoulder harness during the 2-wheel stunt. CHP Vehicle Inspection Sticker is located in the lower right hand windshield. It sits a little higher than the one in CAR 1. The MACH 1 decal on the RH fender sits higher than CAR 1. The underside of the car looks very clean. There are no visible scrapes or dents in the under carriage. There are no obvious dents or marks in the body. This is the car that does the ramp stunt in the parking lot. It appears briefly for this one stunt. The car is moving fast and most of the frames are blurry, so it is hard to discern many details about the car. It does have single exhaust and the MACH 1 decal is missing on the left hand fender. But don't let the missing decal fool you, it is a Mach 1. It has the color keyed front bumper, lower body side moldings and black paint as well as the Mach 1 decal and stripe on the deck lid. And of course the pop open gas cap. The MACH 1 decal on the LH fender is missing. Red trim on the inner windshield pillar. This is the car that does the 2-wheel alley stunt, driver side up. The stunt man, Buzz Bundy, successfully navigates this Mach 1 through the narrow, 6 foot alley, while up on 2-wheels...at least twice. The scene was filmed at Universal Studios on May 25th. CAR 5 was also used for the 2-wheel stunt, driver side up, where the Mach 1 exits the alley. This version of the stunt does not appear in the film, only in the bonus material. This was filmed on 06/04 and there are two different takes of this version. In one of the takes (scene 255, take 2) you can see a long dent that has appeared on the passenger side of the roof. Also, the right hand rear view mirror is now missing. In another take (scene 256, take 2) you can see the bottom of the car. On June 14th the stunt is done again, this time exiting the alley from the other side of the street (scene 257, take 3). Unfortunately these exits stunts were not able to be used in the final film, even though it would have preserved the continuity of this famous car chase. According to the bonus material, these scenes were scrapped because of the crowd of people in the shot. There are even flash bulbs going off during the shoot. Too bad, maybe instead of filming at 8:40PM, they should have waited until after 3:00AM, like the first stunt team. Just sayin'. The undercarriage on CAR 5 is not as clean and seems to have a lot more wear than CAR 3, including muffler damage, fluid stains on the C6 transmission oil pan, etc. CAR 5 is unique to the other Mach 1s, because it has blackwall tires, which was not an option for the 1971 Mach 1...so obviously they were changed. All of these things could be explained if something was modified on the car or if it saw a lot of use between the 04/16, 05/25 and 06/04 filming dates. We are searching for more information and pictures of these cars to help clarify. CHP Vehicle Inspection sticker in the lower right hand windshield. The sticker is higher than CAR 1 and has a distinctive tilt to the inside. Aftermarket blackwall tires. The Mach 1 came standard with whitewalls. If you watch the bonus material on the DVD or Blu-ray, it says that the French, 2-wheel stunt, driver side down, was filmed last. However, by referencing the time and temperature on the "Vegas Vic Sez" sign, as the Mach 1 rounds the corner for its final appearance in the film, you will notice the time is 3:19AM and the temperature is 59°. The temperature never dips that low between the American stunt of 06/14/71 and the last day of filming of 08/13/71. According to Weather Underground, this time and temperature is more consistent with the late evening of both 04/15/71 and 04/16/71, the last days of filming on Fremont Street. In 2012, Richard Hammond of "Top Gear" interviewed the director, Guy Hamilton, in "Top Gear Special 50 Years of Bond Cars". In this interview, Hamilton states that he directed the 2-wheel stunt, exiting the alley, first and the other stunt was done later. This recollection of events matches our findings. Our story doesn't end here. This is really just the beginning. We want to identify and locate all of these cars, even if it means discovering their fate. If not just to satisfy our own obsession, but to preserve historical accuracy for fellow Mustang and Bond fans for generations to come. We know there is a lot more information to discover. So far the resources we used have been limited. However, with just the Blu-ray, a few pictures and some knowledge of 1971 Mustangs, I think we have discovered a treasure trove of information. This article represents just a summary of our research so far. Kurt is setting up a web site where we will have an outlet to share more details about this ongoing project. Look for it early next year at jamesbondmustang.com. If you have any information that could help us with this research project, please contact us. Maybe someone can even explain how the car in this unusual photo fits into the mix. We will post an update once we get the results back from Marti Auto Works. If you would like to be notified of our next article, please join In Search of Mustangs and we will add you to the mailing list. If you haven't seen the film in a while, pick up a copy and enjoy it again! The quality of the Blu-ray is truly amazing for a 70's era film. Mach 1 images are from Blu-ray version of "Diamonds Are Forever"